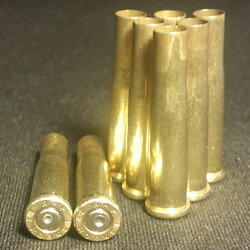 .264 WIN MAG *Polished* Range Brass - 25 count. All mixed commercial head-stamps, yellow brass. I have been buying brass from Diamond K exclusively for 2 years now, The deals they offer can't be beat. Shipping is always fast and the order is always right. Tammy and Jeremiah are the best. 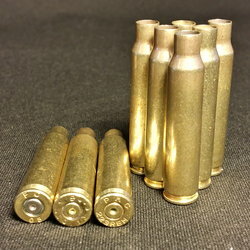 If you are going to order brass or projectiles, Diamond K is the place to get it all. Molon Labe !! Was impressed with the inventory available. I was able to get brass here, that no one else had in stock and hasn't had for quite some time now. Prices are reasonable and shipping was quick. Excellent service, extremely fast shipping all the way to Virginia. Brass was clean, which I didn't really expect but looked at as an added plus. I will definitely be ordering from Diamond K again and again. Excellent customer service, prices and quick shipping. My concerns are minimal, only that I've found less than 1% of any order with crimped primer pockets on pistol cases. I am working with them to get it resolved. Great people to do business with; fast responses to inquiries, quick deliveries, good products. Exceeded my expectations.